Thursday’s High Court ruling represents a victory for the victims’ families and paves the way for a new investigation into the shootings. 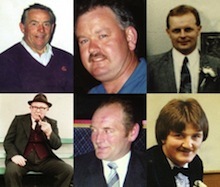 The six men who died, all Catholics, were killed when UVF gunmen went into the Heights Bar in rural Co Down in June 1994. The killers opened fire indiscriminately as customers watched Ireland play Italy in a World Cup soccer match. Those shot dead included 87-year-old Barney Green, one of the oldest victims of the Troubles. Also killed were Eamon Byrne, Malcolm Jenkinson, Daniel McCreanor, Patrick O’Hare, and Adrian Rogan. Five others were seriously wounded. No-one has been convicted of the murders although 16 people have been arrested in connection with the attack. Victims’ relatives suspect the police investigation was undermined to protect informants. In June last year former police ombudsman Al Hutchinson concluded there was insufficient evidence of collusion. In a highly controversial report, he only identified failings in the police investigation, criticising it for a lack of diligence and leadership. Hutchinson later stepped down amid a scandal over the operation of the Ombudsman’s office and the manner in which reports were drafted. His report on Loughinisland was branded a whitewash by the victims’ families, who launched judicial review proceedings in a bid to have it overturned. In court yesterday it was confirmed that Dr Maguire had agreed to the move, and to the order that his predecessor’s statement be quashed. Lawyers for the families described the outcome as a significant milestone in their campaign to establish the truth surrounding the atrocity. Niall Murphy of Kevin R Winters solicitors said it was the first successful judicial review of a report by the police ombudsman’s office. “Our clients’ strong criticisms, made immediately in the wake of the publication of the report in 2011, have been vindicated and they deserve credit for their perseverance and dedication to establishing the truth about what happened to their loved ones. The decision also provides for a brand new reinvestigation,” he said. Emma Rogan, whose father Adrian was among those killed, said the outcome vindicated the families’ belief that the original report was flawed and irrational. “It is a disgrace that the onus was put on us to take the office of the police ombudsman to the High Court to drag the truth out of the facts that only his office are aware of,” she “The conclusion of Al Hutchinson’s flawed report was that the complaint of collusion was ruled out due to insufficient evidence. Sinn Féin Assembly member Caitriona Ruane also welcomed the move. “It was clear that the families had no confidence in this investigation and its findings,” she said. “The conclusions reached were totally incompatible to the evidence produced which clearly pointed at collusion.